From time to time I have to forget about the catalogues and website updates and set aside a few days to update the database. There are still many thousands of items to catalogue and as the database is the heart of the project it’s time well spent. This update (15th February 2108) covers the years 1935, 1949 and 1965. 1100 new listings have been uploaded for 326 companies. The database count now stands at 63,467. In my previous post I talked about the Brabazon types and the first generation of post-war airliners. Indeed there’s still part 2 of the article to write. In fact 1949 yielded a more interesting batch of adverts in this respect than 1950 which is why I chose this as one of the years to update this time round. As the database grows and the ‘supply chain’ entries are updated it’s interesting to compare items from the same company or category over the years. 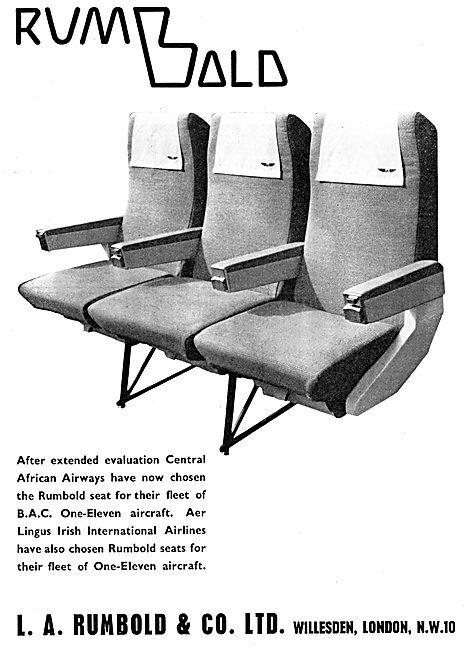 This time I’ve chosen seating, and the prominent manufacturer for these over these years is Rumbold. They’re not the most attractive of their adverts, but illustrate their dominance in the market. 1965 was all about the VC10, BAC 1-11 and Trident so the last item is most appropriate. 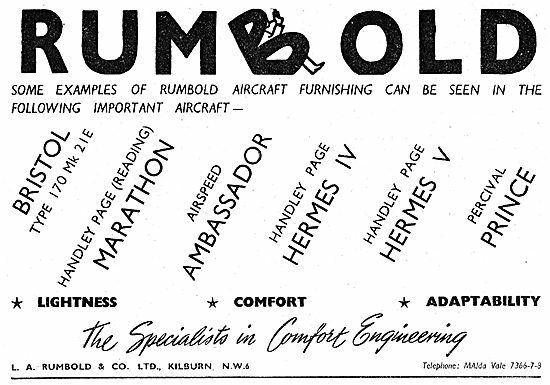 Why not try a search using the keyword Rumbold for the years 1933 to 1971 – I think you’ll find it interesting to compare designs and marketing message. There are still more to add, but you’ll have to wait for the next update for those.